My 9 year old's planting bed is hosting pumpkins and California poppies. He chose the seeds this spring. On a walk with some family members last week, my youngest started a game of identifying the plants we passed. After he got 9 out of 10 correct, I had to give myself a pat on the back. Have I been patiently teaching my children botany? Quietly sitting down with them over photographs? Not at all. I've simply been putting them to work in the garden. For the past several years, I have given my boys simple chores in the garden. While each has their own "garden bed" planted with various edibles and flowers, for the most part, the garden chores I give my children are designed to take things off of my plate. I know realize how, in sharing the work load, I am actually sharing my knowledge. Teaching life skills. Imparting information that cannot readily be learned in a book. A garden pest becomes a child's pet - and your garden is the happier! 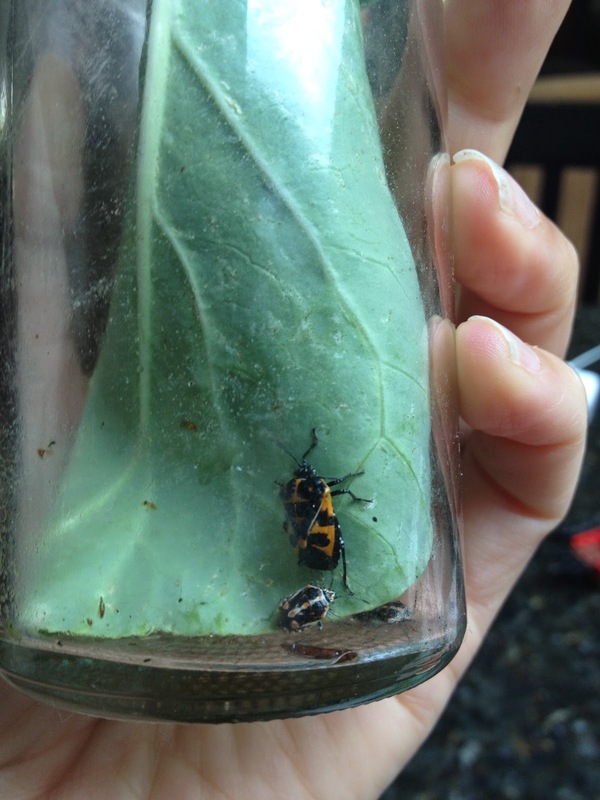 Say what you will about my rowdy, rambunctious boys but they know when a radish is ready to be picked and the difference between a lady bug and a cucumber beetle! That doesn't even take into account all of the Vitamin D they are soaking up. Do you put your children to work in the garden? What chores do they do and how has it changed them? Gardening isn't a chore, it's a pleasure! Yes, it is work at times. But, the very n best kind of work! We haven't spent much time gardening this year, but I love to get my kids out there whenever I can. Great suggestions! @Brent W - Too true!! Though I have a couple kids here who might disagree with you, I wholeheartedly agree. I was forced to do garden "chores" as a kid. I hated it but once I grew older, I realized all I learned. @Brenna - Thank you! I wasn't as good about this last year but this year, I've been on fire with my garden! I think it's great to get kids out in the garden for chores or for fun! @robbie: I love that! What a great reminder. I send me kids into the garden to look for pests. They forget about the chore and get lost looking for bugs. @Lindsay: Thank you! It is a win, win on so many levels. How much do I love that your kids can identify the food they eat???!!! It's the same here, although unfortunately, my guy is not an "outdoorsy" type. But he does know how to check for the ripeness of his favorite fruits and veggies. These lifeskills can only enhance their lives. Rock on!